Tramp juice. Camden wants to curb sales of super strength lager in Bloomsbury, Kings Cross, and Holborn and Covent Garden wards. But it is doing little to tackle a bigger problem. 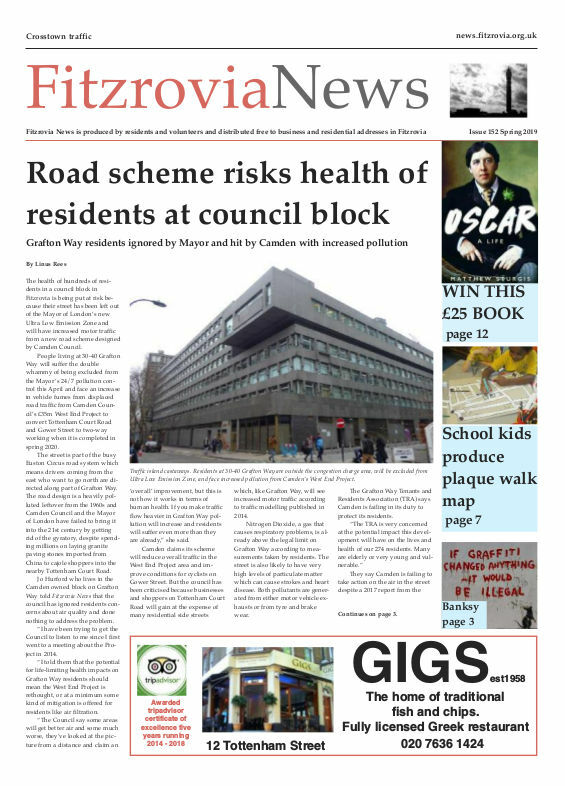 Readers of the Evening Standard and the Camden New Journal may have seen articles last week about an initiative by Camden Council to stop sales of super strength lager and cider in off-licenses in south Camden. Someone in the Town Hall is busy running a public relations campaign this festive season. 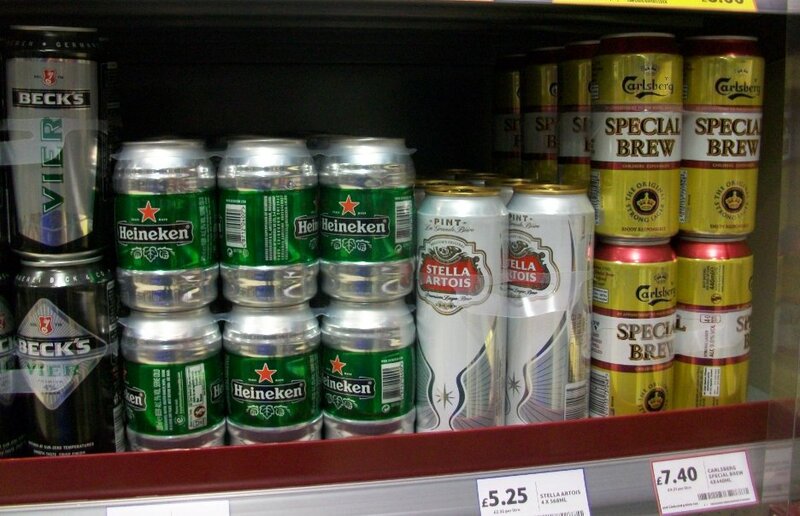 “A pilot scheme will ask shops in the King’s Cross, Bloomsbury, Holborn and Covent Garden wards to volunteer to stop selling drinks such as lager and cider with more than 6.5 per cent strength,” wrote Miranda Bryant in the Evening Standard. The scheme comes after the initiative apparently proved successful in Ipswich where the police reported a 49 percent drop in “street drinker events”. The homelessness charity Thames Reach has since 2005 campaigned to limit sales of super strength drinks. In Australia and Ireland, super strength lagers and ciders are not on sale. In Australia there are lower taxes on low alcohol beers. Beers under 3.8% in strength now account for 40 per cent of overall beer consumption. Between 1980 and 2000, alcohol consumption in Australia fell by 24% whilst over the same period consumption of alcohol increased by 31% in the UK. Interestingly, during this period Australia liberalised trading hours, as we have done recently in the UK. Camden says it is working alongside the police, NHS and The Fitzrovia Partnership Business Improvement District. I think it is commendable the Camden Council are addressing super strength lager consumption by street drinkers. But it is just addressing one aspect of the problem with alcohol consumption. What readers of the Camden New Journal and Evening Standard would not have read about is that alcohol consumption on the streets of Fitzrovia is getting to be a widespread nuisance for many people living here. The main nuisance is not in general from “street drinkers” or sales from retailers but from some pubs and bars who allow huge numbers of their customers to drink on the pavements. 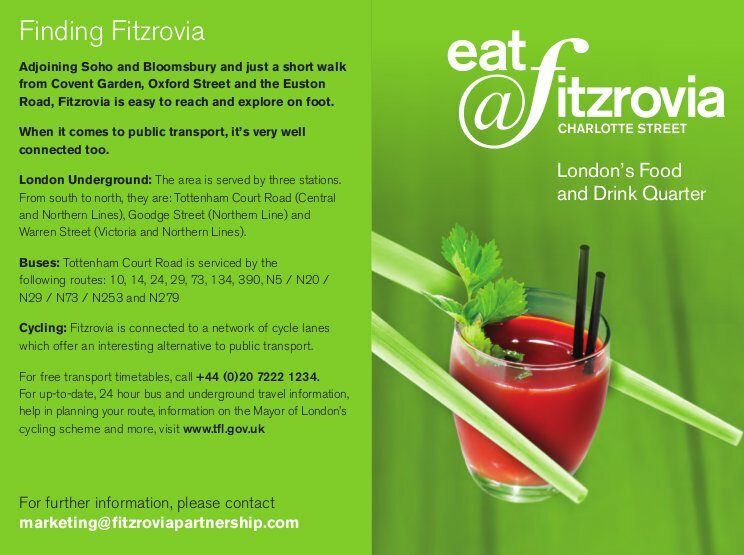 The Fitzrovia BID’s leaflet introducing London’s Food and Drink Quarter. Camden Council are doing little about this problem and The Fitzrovia Partnership BID are actively promoting the neighbourhood as “London’s Food and Drink Quarter”, which has led some people to suggest that the Fitzrovia BID has replaced Camden as the local authority. The Hope on the corner of Tottenham Street and Whitfield Street. 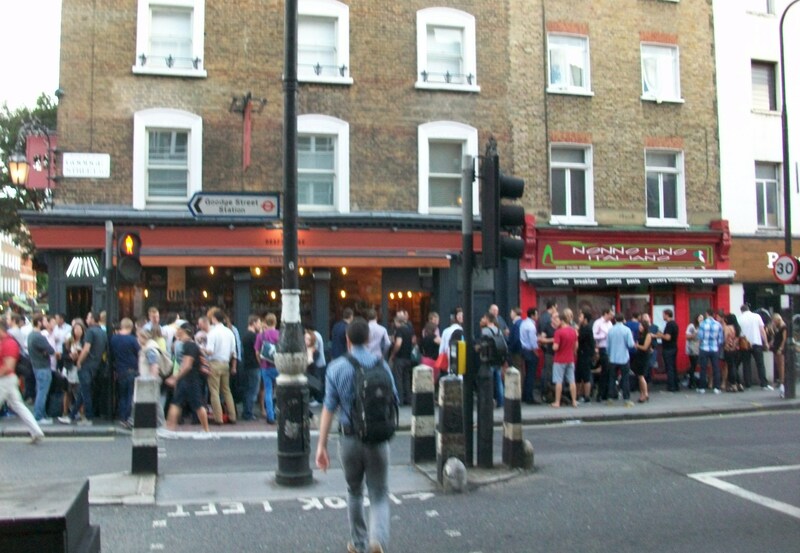 Take a wander along Charlotte Street, Goodge Street or Whitfield Street during a Thursday or Friday early evening and you will often see sometimes hundreds of people blocking the pavement drinking outside some of the pubs. At times there are so many after-work drinkers that they even occupy the pavement outside neighbouring premises. Something that Fitzrovia News has written about before and has been published in the Morning Advertiser. 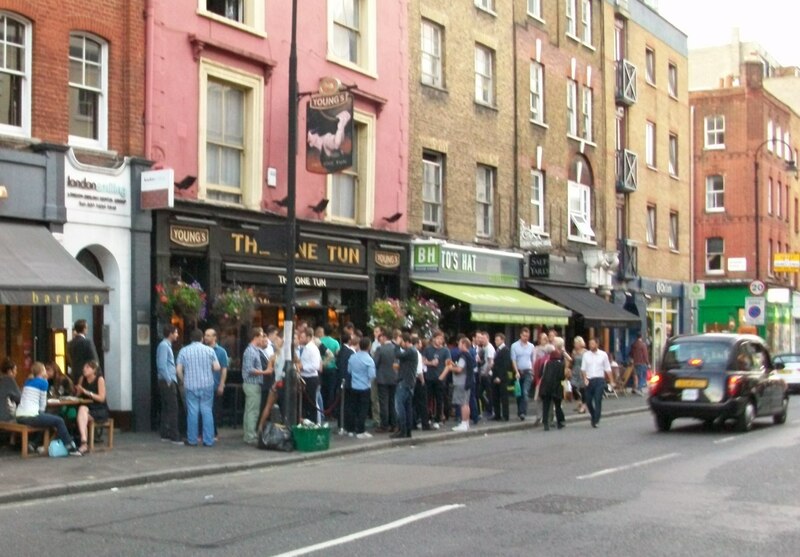 Crowds outside The One Tun in Goodge Street block the pavement. This is not only a public nuisance because of the noise but an issue of public safety. Yet Camden Council seem to be practising a voluntary code of compliance for these premises. And in some case it appears to have abandoned any semblance of control, appealing to licence holders rather than carrying out any enforcement. No room at the inn or the pavement as pedestrians forced to walk in the road outside The Draft House on Goodge Street. When a neighbour of mine complained about a pub after his primary school aged daughter was knocked into the road by someone standing drinking outside one of these pubs, Camden Council said they would take action. But nothing changed. Even when our local councillor Adam Harrison wrote a strongly-worded letter and provided a photograph of the pavement blocked it had little effect. I took photographs of three pubs (shown here) and sent them to Camden’s licensing enforcement. Result: nothing. In this latest initiative Camden seems to want to just draw attention to an easy target: street drinkers. And these are often also homeless. I’m not saying “street drinkers” are not a problem, they often are. But why is Camden Council focusing laser-like on their behaviour and not the management of public houses it has given a licence too? The Fitzrovia BID are busy spending relatively vast sums of money on promoting Charlotte Street and Goodge Street as a food and drink quarter. Where is this going to lead to? 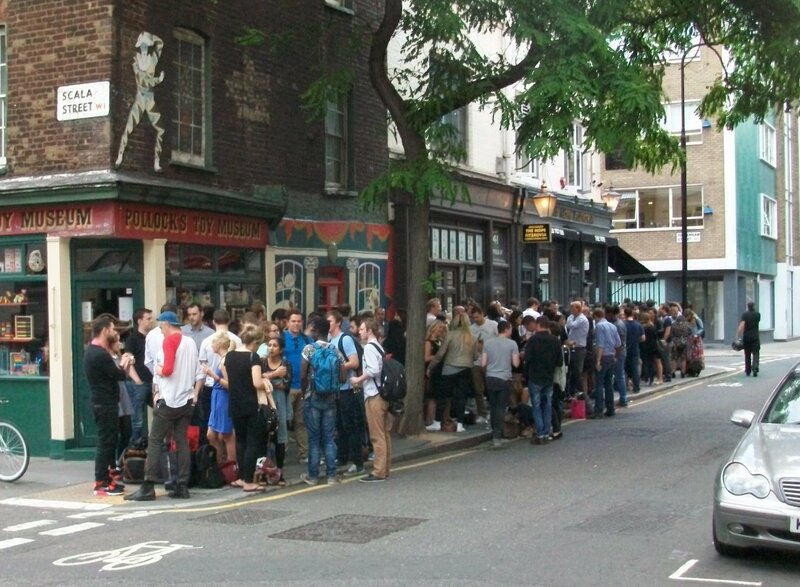 Camden continues to give out new licences to premises in Fitzrovia. Why is almost every new cafe and restaurant that applies for a licence given one? Fitzrovia is becoming saturated with these premises. Clearly the council as the responsible authority is incapable of enforcing against premises it licences, or it lacks the will to do so. Is Camden useless, or just lazy? Or — dare I suggest — have Camden’s licensing officers been supping too much super strength lager themselves? Perhaps it’s their own anti-social licensing policy that should be examined.